Aha! is the world's #1 product roadmap and marketing planning software. We help more than 5,000 innovative companies build and launch products customers love. More than 250,000 users worldwide trust Aha! to set brilliant strategy, capture customer ideas, create visual roadmaps, and manage breakthrough marketing programs. 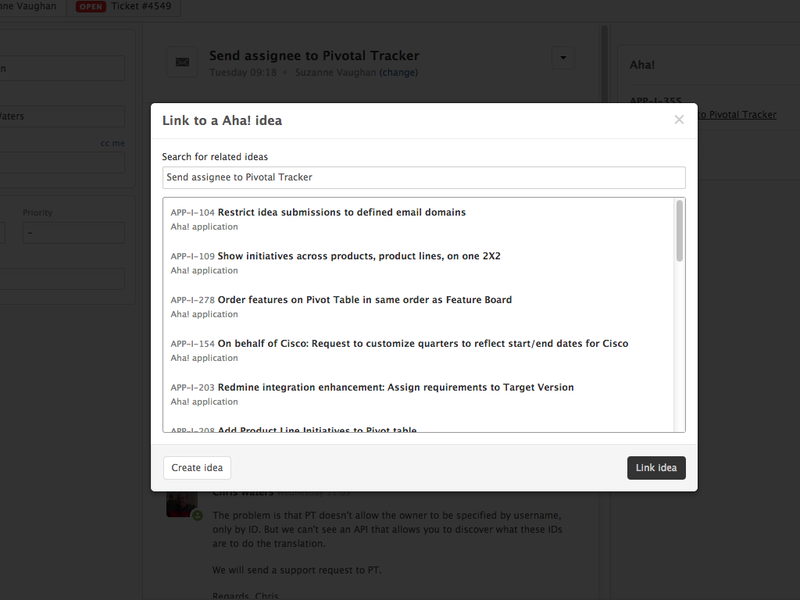 This integration enables your support team in Zendesk to take customer requests and convert them into ideas in Aha! The ideas can then be reviewed by the product team in Aha! and prioritized on the roadmap. And when the status of the idea changes in Aha! 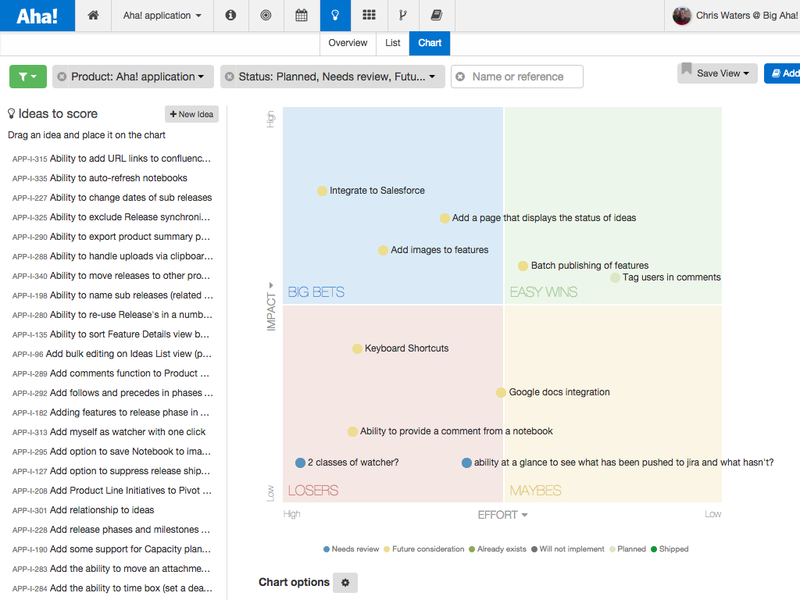 it is automatically highlighted in Zendesk — so it is easy to see how the customer's request is progressing through development. Learn more at www.aha.io and contact us at support@aha.io if you have a question. Have at least the Contributor role for for the products that you want to submit ideas to. Have the Customizations Administrator role in your Aha! account. 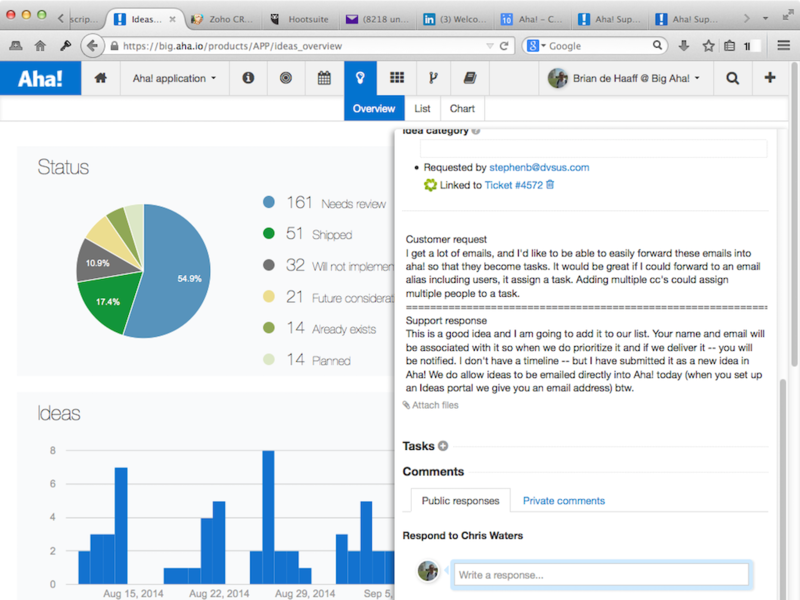 Zendesk agents will not need an Aha! account to link to ideas in Aha! or to create new ideas. Install the Aha! app in Zendesk. Configure the app by entering the subdomain for your Aha! account. The subdomain is the part that comes before .aha.io in the URL when you access Aha!. Go to a ticket in the Zendesk user interface. Open the apps sidebar by clicking the Apps button in the top right of the user interface. In the Aha! app, click on the link that says Authorize this app. You will be prompted to log in to Aha! and to authorize Zendesk to access your account. Once the app is authorized it will be usable by any Zendesk agents without the need for an Aha! account for each agent.